Finding gems in a city like San Francisco is easy. There is always a new coffee shop and café to try or in this case a new boutique to explore. The Inner Sunset is filled with great independently owned shops, but this one takes the cake. Not only is it affordable, it is unique. This small boutique is packed with a plethora of fashionable items. From wool scarves to funky graphic tees to jersey cotton dresses, Paragraph captures San Francisco’s bohemian-chic style. 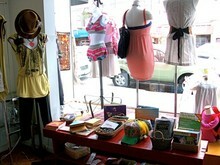 What sets this store apart from other boutiques is the care in selection of items and choice in clothing in the store. 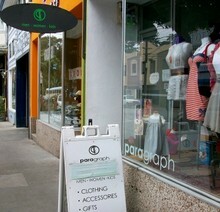 Paragraph offers fashionable collections for women, babies and a small section for men. The majority of the clothing is made from local designers. Brands include L.A. Made, Taxi CDC, Colcci and Tutti Ensemb. In addition to choosing local fashion the co-owner, Vanessa, also displays handcrafted jewelry and accessories. Vanessa creates some of the rings herself. If you want a piece of jewelry of hers that is not in your size she will happily create one for you. Some other jewelry designers she displays are CSJ Jewelry, Liliana Swearingen and Twelve Designs. The baby section of the store is adorable. Clothing is made of organic cotton and is displayed in a checkered pattern on the back wall of the store. The tiny clothes reflect the latest trends in fashion. Miniature pink tights, printed hoodies and baby halters are cute enough to ohh and ahh at. Living in San Francisco everyone seems to have the same baby-doll shirts from Urban Outfitters and the same cotton dresses from Ambience. And because of this I always find it so refreshing to find a piece of clothing that is one-of-a-kind. After the Glen Park location of Paragraph took off, Vanessa and Veronica Viray (the other owner) opened this second store. It has been a great addition to the 9th and Irving area. Vanessa also offers exceptional customer service. It is always nice to enter a store and feel like the employee actually cares about finding you what you want. Whether it is a feathered headband or gold leather belt, she constantly surprises me with fresh ideas for apparel. Every time I stop in, she asks me what I’m looking for and caters to my style. She shows me new items that have come in and trends I might be interested in. She also can give you details on each collection, which is a personal touch that you can’t get at Nordstrom’s. 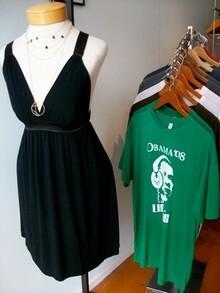 Most clothing pieces are upward of $40, but you can find T-shirts for $20 and some dresses can get pricey (around $250). There is usually a sales rack of discounted items and on weekends Vanessa likes to have designers showcase their pieces on the sidewalk for weekenders to look through. There are also some soy candles to sniff and occasionally a few purses and wallets to peruse through. The next time you are strolling by the park and feel like browsing, stop by this cozy boutique and breathe some fresh air into your wardrobe.